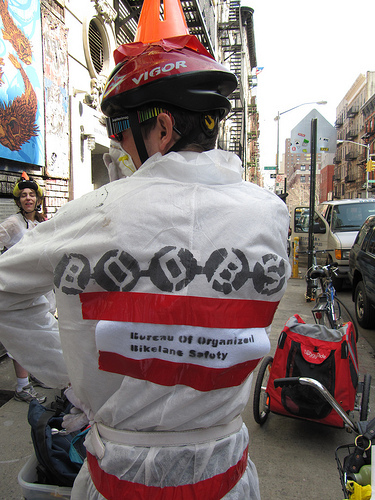 On Friday, March 19th, agent-technicians from the Bureau Of Organized Bikelane Safety (B.O.O.B.S.) descended by bicycle on the intersection of Broadway and 23rd Street. The team arrived promptly at noon to prepare for a patrol up the 6th Avenue bikelane between 23rd and 40th streets. The B.O.O.B.S. is charged with clean-up and removal of all gas-guzzling, dangerous vehicles illegally parked in and polluting city bike lanes. In the shadow of the Flatiron Building, the six agents checked and tested their gear: suits, masks and goggles to protect from heavy metals and toxic gases along with high-visibility cone-helmets, flags, and cones to be used to safely establish a quarantine perimeter around the hazardous obstructions. Upon securing a hazardous pile, agents planned to employ an arsenal of high-tech gadgets to measure the severity of the situation. Several trailers towed by team members contained crucial instruments for toxic clean-up, including a high-powered sonic "boom-box" for a focused decontamination technique, which is dance-like in its precise execution. While preparing to patrol, agents communicated with curious civilian passers-by about their mission, and multiple members of the media competed for the inside scoop on the B.O.O.B.S. Several civilian bicyclist supporters joined the ride in hopes of seeing the B.O.O.B.S. in action. The agents slowly proceeded up 6th Avenue, targeted for clean-up due to noxious amounts of motor vehicle traffic. Though encountering an estimated average of 1.5 toxic obstructions per block, the B.O.O.B.S. team found that the bikelane contamination level, while still very hazardous, was less than expected. It only takes one toxic obstruction to sully the utility and beauty of a bikelane. Several obstructions were only partial, and removal was generally prompt as the team employed clean-up methods including gentle reminders to polluters of the law regarding bikelanes. A choreographed de-briefing occurred at the end of the patrol. Satisfied in a job-well-done for the day, a few agents dispersed on individual survey patrols, while the remaining agents traveled south on 5th Avenue to return to headquarters. Unfortunately, proof that the dirty job is far from complete was even more abundant on the 5th Avenue bikelane. Multiple gas-burning, heavy-metal heaps were found by the team, including several apparently left by another hard-working agency, the city police. The reduced B.O.O.B.S. team was unable to achieve similar levels of success as they had on 6th Avenue. The B.O.O.B.S. is hard at work to clean up these pollutants which disrupt the delicate urban environment, but it will take some major inter-agency cooperation to prevent all the Class II bikelanes in New York City from being declared Superfund sites.